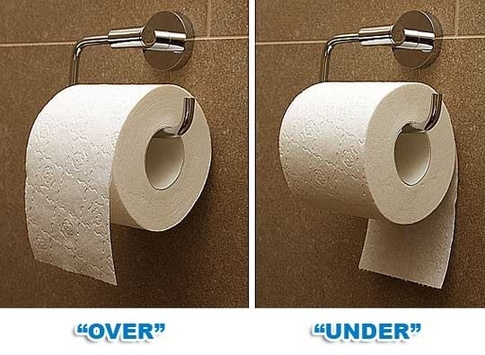 I sigh every time I see toilet paper hanging under the spool as opposed to over. Toilet paper orientation is a big deal. So big I sometimes switch offending rolls mid bowel movement. It’s one of my OCD indulgences. But spool orientation is more than just preference. Researcher Barry Sinrod found that 68% of Americans roll over. In fact, 60% of those who earn $50,000 a year or more roll over. Meanwhile, 73% of those who earned less than $20,000 roll under. I’ll give it a shot. Rolling over conserves more paper. It’s not as easy to let it fly, but it offers better control. Under, on the other hand, is easier. Similarly, making less than $20,000 a year is easier than $50,000. Granted, being underprivileged isn’t always about taking the easy road, even though it is some of the time. And 40% of middle class and higher roll under. But that’s the best I can come up with. This study is scheduled to conclude today. A three year examination of what happens when we die, conducted by a doctor who wrote a book on the subject. The thesis found that phenomena occur after we die, such as the mind retaining verified memories for prolonged periods of time, even after the brain stopped receiving blood.